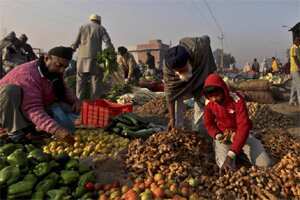 New Delhi: Annual food inflation eased for a ninth straight week to its lowest in nearly six years in mid-December on improved supplies, bolstering hopes of a cooling in overall inflation that will allow the central bank to shift focus to reviving growth by cutting rates. Food price index rose 0.42% in the week to 17 December from a year ago, its slowest rise at least since April 2006, as prices of vegetables, potatoes and onions fell by upto 11% on new crop arrivals in markets. “Moderating food prices should cool overall inflation. We expect headline inflation below 8% in December," said Aditi Nayar, an economist with ICRA. “It will allow the Reserve Bank of India to be on pause for a few months, before it starts cutting rates in April-June quarter next year." Country’s headline inflation was 9.11% in November, staying stubbornly above 9% for a year mainly driven by high food prices. The RBI, which has raised its interest rates 13 times since March 2010 to tame sticky inflation, expects the headline inflation to ease to 7% by March. With risks to economic growth mounting, pressure is building on the central bank to reverse its tight monetary stance. The RBI left its rates steady at its last review early this month and sent a strong signal that its next move was likely to be an easing of monetary policy. Analysts widely expect the RBI to cut rates by 25 basis points by mid-2012, a Reuters poll found early this month.